Halfstack was an independent culture magazines focused on and dedicated to the local Chicago community. We showcased musicians, designers, boutiques, brands, artists, local entrepreneurs & social changers who are on the rise because of the impact they are making and the hard work they are putting into their craft. 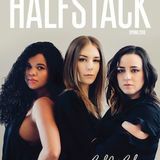 Halfstack shuttered it's brand in May of 2018 - after 6 years of publishing, founder - Jen Lezan Veguilla made the hard decision to shut down production. You can still find inspiration on her podcast: Make + Create available on all podcasting platforms.